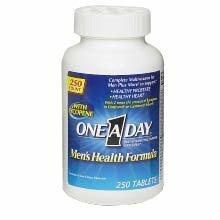 One-A-Day Men’s Health Formula is a complete multivitamin plus key nutrients to support a healthy heart, and Selenium to support a healthy prostate. Prostate cancer is the most frequently diagnosed cancer in men, and emerging research suggests Selenium may reduce the risk of prostate cancer. A bottle of vitamins. I probably wind up dumping most in the toilet (as do we all), but these seem to get good reviews and are reasonably priced, so there you go. I switched from Centrum to this brand because it was on sale. It turned out to be a pretty bad deal in the end as it upset my stomach.